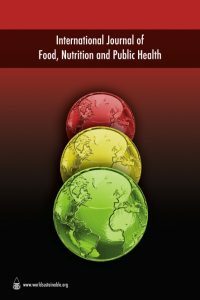 Abstract: This pilot study was carried out to assess the nutritional status, blood pressure (B.P) and dietary intake of some school adolescents in Giza governorate, aiming to investigate the relationship between adolescent nutritional status and the development of diet-related Diseases. 308 students were randomly chosen from 5 public secondary schools. Clinical examination, B.P, and anthropometric measurements were recorded. BMI was calculated. 24 hour dietary recall and socioeconomic questionnaires were filled by interviewing the students. The study revealed that 2.6% of the students were stunting, and by using weight/age and BMI parametres, 26.6%, 6.8% were obese The mean energy intake was below the RDA, with a wide range between low and high values among the three social groups. The mean daily intake of some vitamins &minerals were low. Over weight/obese and chronic undernourished students had mean B.P higher than normal weight. There was high positive correlation (p0.01) between both systolic and diastolic BP and most of the anthropometric measurements except for height when sexes were taken in consideration. In conclusion these data clarified the presence of both under and over nutrition among Egyptian adolescents and reinforce the association between both conditions and the elevated BP. Further more high salt consumption may be a common and important factor associated with the elevated blood Pressure.